“Cavalcade.” Composed by various artists, including Noël Coward. Recorded under the direction of Ray Noble (uncredited) in London on November 24, 1931, with narration by Henry Oscar and with uncredited soloists (including Elsie Carlisle), full chorus, orchestra, and organ. HMV C. 2330, matrices 2B-1546-2 and 2B-1547-1. “Cavalcade (32 Years of England)” is derived from a stage play of the same name by Sir Noël Coward that was enormously successful in 1931 at the Theatre Royal, Drury Lane, with 405 performances. The play concerns the life of a British family and their servants and spans over the first three decades of the twentieth century. It was the inspiration for a 1933 Fox film. The play “Cavalcade” includes music contemporary to each period it depicts that was either chosen by Noël Coward or even written by him (“Lover of My Dreams” and “Twentieth Century Blues” were both introduced in the drama). The musical revivals inspired a number of recordings, such as the HMV medley with Noël Coward as vocalist (side one and side two), one by The New Mayfair Orchestra (under the direction of Ray Noble, with prologue and epilogue spoken by Noël Coward), and medleys by Sam Greening’s Rhythmic Troubadours, Jack Hylton and His Orchestra (both in early November and in mid-December; you may hear side A and side B of the latter on YouTube), and Jay Wilbur and His Band. 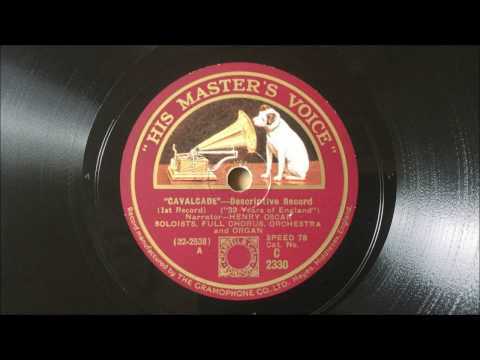 The 1931 record labelled by HMV as “‘Cavalcade’–Descriptive Record (’32 Years of England’)” credits prolific British actor Henry Oscar as narrator, but leaves the “soloists, full chorus, orchestra, and organ[ist]” unnamed. Ray Pallett has identified Ray Noble as the leader and arranger and Max Goldberg as one of the trumpet players,1 but it is the audible presence of Elsie Carlisle as soloist (and presumably also as ensemble member) that interests me most. To make a man of any one of you! Elsie would record Coward’s music again one year later, with Mad About the Boy (recorded with Ray Starita and His Ambassadors). Even though her role in this HMV recording is easily overlooked, Elsie distinguishes herself with gestures to music dating from the beginnings of her career as well as to current compositions. The brevity of her solos allows her to show her dexterity at summoning up a character at a moment’s notice. Bold, saucy, querulous, and comical, Elsie Carlisle shines as a talented singer on this strangely anonymous record.